I will get to the new developments first. 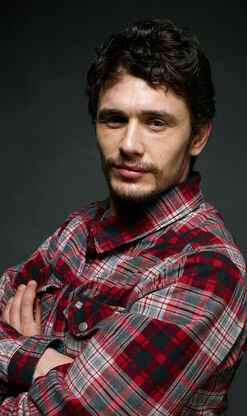 News broke earlier this week that actor James Franco has landed the lead role in the prequel. Franco is an actor I've liked since Freaks and Geeks and having him as the lead in a Planet of the Apes prequel seems like a nice fit. So who exactly will James Franco be playing? Variety says he'll play, "A driven scientist who becomes a crucial figure in the war between humans and apes." That description is extremely vague and hypes up something we won't see in "Rise of the Apes," so after a bit more digging I've learned that Franco's character is desperately trying to cure his father's Alzheimer's in the present day. Instead of curing Alzheimer's however, he creates a hyper intelligent chimp named Caesar, who will eventually lead up to the 'Apes' movies we previously know and love. 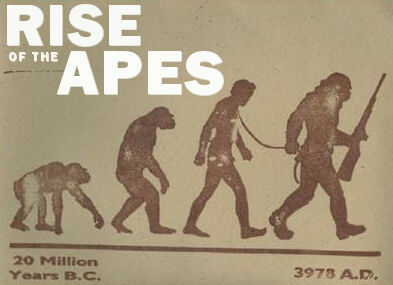 Don't get too excited about "Rise of the Apes" leading into Planet of the Apes because it doesn't. This prequel sounds far more like a prequel to a prequel. Meaning I expect one more prequel to follow 'Rise' that will lead into the original Planet of the Apes movie. 20th Century Fox recently revealed the official synopsis to "Rise of the Apes" and it goes a little something like this: An origin story in the truest sense of the term. Set in present day San Francisco, the film is a reality-based cautionary tale, a science fiction/science fact blend, where man’s own experiments with genetic engineering lead to the development of intelligence in apes and the onset of a war for supremacy. Truthfully, "Rise of the Apes" sounds similar in vein to the 1987 movie titled Project X with Matthew Broderick. 'Rise' is not going to feature a bunch of talking apes or chimpanzees taking over the world as we know it. Instead it will be the absolute beginnings of that. An idea that could easily backfire on 20th Century Fox. Here are a few of the technical aspect to the property. Rupert Wyatt (The Escapist) will direct off a screenplay penned by Amanda Silver and Rick Jaffa. 'Rise' intends to go before lenses this July and is set for a June 24th, 2011 release date. The prequel will utilize some of the same technology used in Avatar to design the hyper-intelligent apes Franco's character will create. Yup, CGI apes. Gone are the days of people in suits. Well at least, for this prequel. I know this has to be a thorn in the side of every Planet of the Apes fanatic, but honestly, having CGI chimps in "Rise of the Apes" makes a lot more sense than having people in suits. We are talking about chimpanzees, not full grown gorillas like we were use to previously from the franchise.